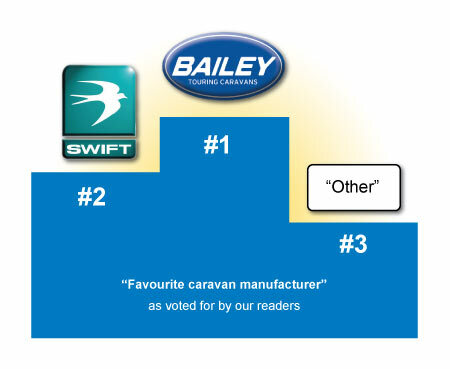 Bailey caravans of Bristol have fought off tough competition to be voted our readers’ favourite caravan manufacturer. Swift came in second and then ‘Other’ came in third, showing that there may have been a few smaller manufacturers who are popular amongst caravanners. One major manufacturer who we forgot to add into the vote was Coachman, and after many comments from people saying they voted ‘Other’ because Coachman wasn’t on the list we can only assume this is the reason for the surprise third place result. Rest assured we won’t leave them out of future votes and in the meantime a big well done to Bailey and Swift!